With 40 years of experience in the construction of luxury homes, we are proud to be one of the leading home builders in Syracuse, New York. Our luxury homes can be found throughout Upstate New York and Central New York and in these fine towns: Liverpool, New York; Cicero, New York; Clay, New York; and Manlius, New York. Eldan Homes creates neighborhoods where you want to live. 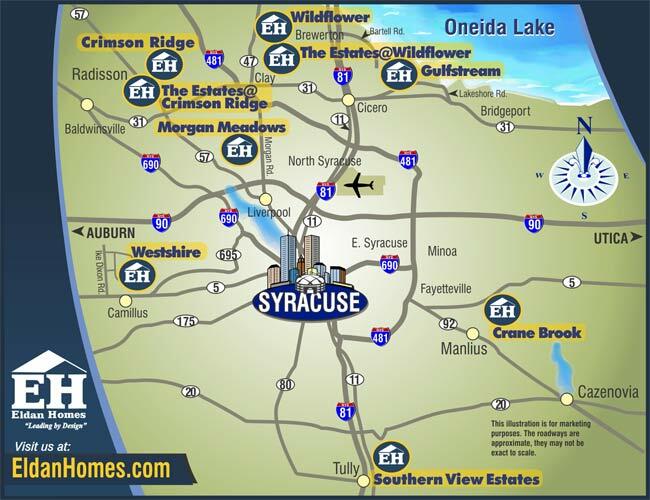 Our new homes in the greater Syracuse, New York area feature luxury house plans that reflect your lifestyle needs. From our colonial, craftsman and arts & crafts style house plans, to our Florida style ranch house plans, Eldan Homes' designs are unique, exquisite, and wonderfully affordable.